Sunday was “another crappy day in Paradise”, as Jim likes to say. tongue in cheek. It was another beautiful day in Punta Gorda. We started the day by accompanying Marilyn to her church — Faith Lutheran Church. We’ve been there with her before and always found it very welcoming. 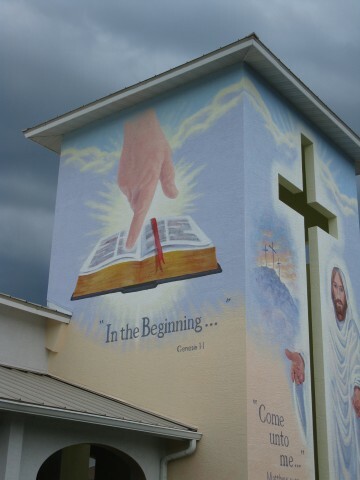 This day the pastor proudly announced that the outside murals had been completed. 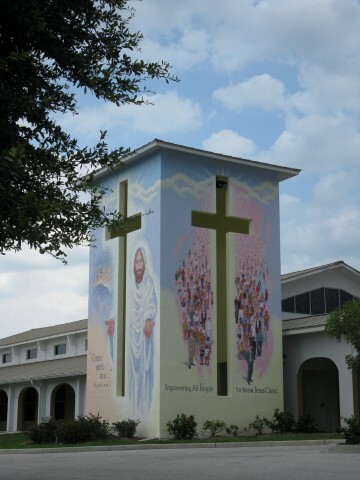 Apparently a parishioner had made a generous donation with the stipulation that the walls of the church tower be adorned with murals. A local artist, who has done many other mural around Punta Gorda, was commissioned to do the work. The pastor and his committee spent many hours designing and deliberating over the proper messages to be included. The result turned out beautifully. 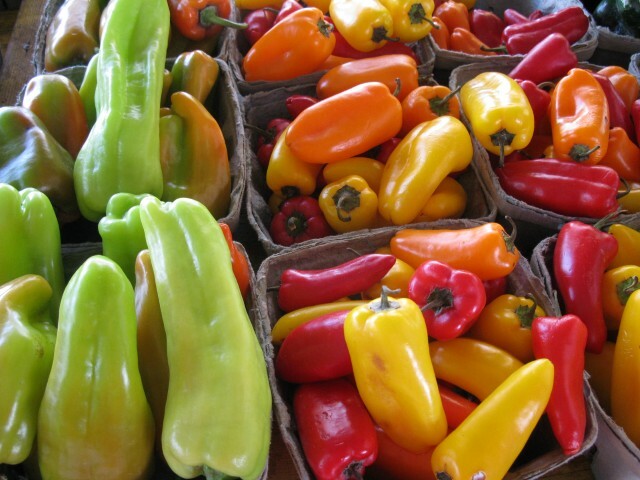 After church, we went to the local Farmer’s Market for some lovely fresh produce. One stall sold a variety of plants. It was so busy, I was unable to get close enough to ask what this interesting plant was. Does anyone recognize it? 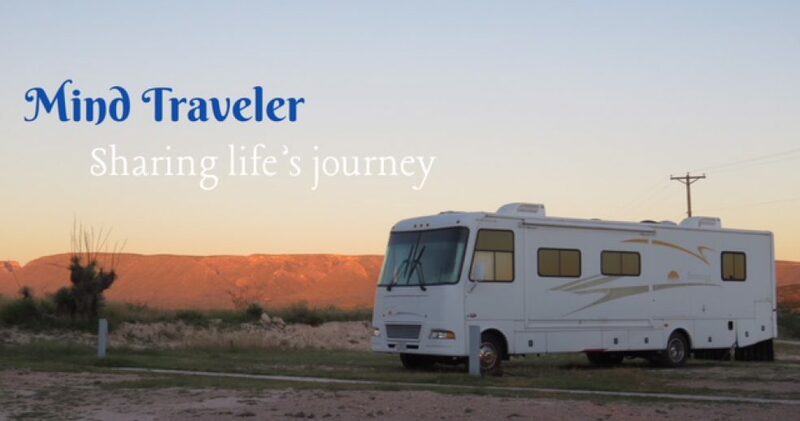 This entry was posted in RV Travel, Travel and tagged Faith Lutheran, Farmer's Market, Florida, Plants, Punta Gorda, RVing, travel. Bookmark the permalink. Captain Nemo is correct. It is Nepenthes mirabilis or Swamp Pitcher plant. Native to Thailand. Took a while to Google it without getting all the Venus Fly Trap results. 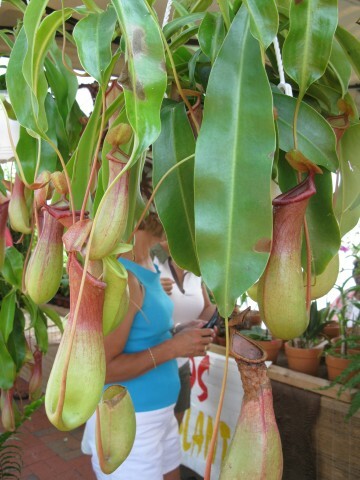 That is a beautiful example of a pitcher plant, Nepenthes, Tropical Pitcher Plants or Monkey Cups. Insects fall in there and get digested. Judy, your stories are fascinating — so well told so one almost feels as if one was there with you. The photographs really help to complete the visual picture. I look forward to reading and looking at each new day with you. Punta Gorda is a beautiful place – so colourful and alive. Some of the homes with geometric shapes in bright spring colours depict some Spanish influence. Glad you were able to resolve the situation of storing your trailer. You ride above the trials that come your way. I just don’t know when you find the time to write. Sorry I have not written much over the past 2 weeks. I had food poisoning and landed in the hospital overnight to receive 3 bags of rehydration fluid, xrays and blood tests. Then this week my frig/freezer hit the dusy (compressor), so quickly had to find a place for my food. Then rushed to Sears and ordered a new one but it is not coming until Fri. June 1 (one week after buying). So in the meantime, my son had a tiny bar frig and a camping cooler which works on AC/DC. And 2 days ago, my heat pump went, so no A/C available until a new one is installed. The temperature yesterday reached 8l.5 F in my apartment, but the temperature cooled somewhat to 80 todayand a cooler night is predicted around 61 F. Yahoo! have no clue please let us know when you do? is it a fruit tree?